Foraging grounds play an important part in the sea turtle life cycle. After hatchlings exit the nest and make it safely to the sea, they swim in a frenzy to reach the open sea. The ‘lost years’ is the little-known period when young sea turtles stay away from land until they become juveniles. Young turtles develop specialized feeding habits and areas, which vary between species. These are the foraging areas or over-wintering areas where they find food and refuge. In the Mediterranean nesting occurs only in the eastern basin (Turkey, Greece), whereas the western basin (Tunisia, Libya, France, Italy, Malta, Spain) is predominantly used as a foraging ground and possibly, as developmental habitat for juvenile turtles. In MEDASSET’s 2005 Rapid Assessment Survey of important Marine Turtle and Monk Seal habitats in the coastal area of Albania; Fishermen, using different types of gear, provided details of their by-catch, sightings and most recent encounters with turtles. By-catch data showed a marked difference in the number of turtles captured annually between the north and south of Albania. 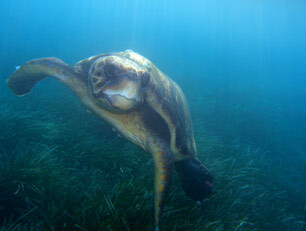 Typical catches per fisher per year were 2-6 turtles south of Durres, and 100-250 turtles in the north. Juveniles were mainly captured in shallow waters <10m (trawls, nets, long-lines, and stavnike) during April-May, which suggests that an important foraging habitat for juvenile loggerheads may exist in northern Albania. For the full report visit press here.